Photo courtesy of my friend Laura. 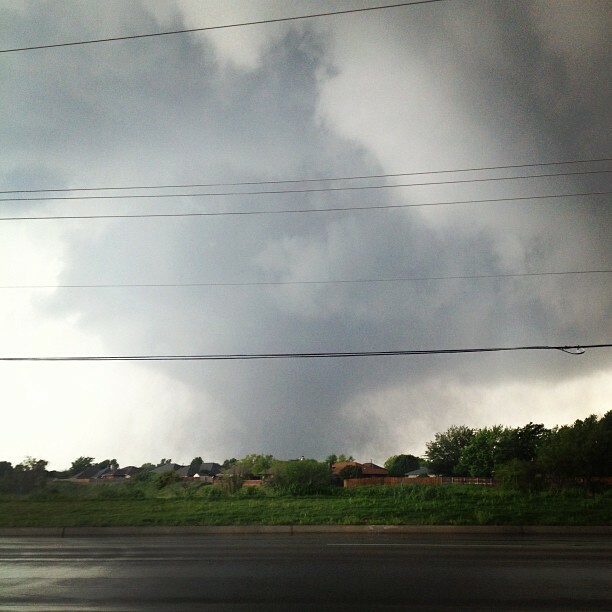 Taken from her house right before she fled the tornado. She is fine, but her house was destroyed. This is an excellent prompt for today, because I just so happen to have a timely and controversial rant that's been swirling around in my head for the past few days. I don't normally rant about controversial topics unless it's to someone whom I know will agree with me, but it's happening, people. On Sunday and Monday, Oklahoma was devastated by tornadoes. Dozens of people were injured or killed, and homes were destroyed. The worst of it hit on Monday, just 15 miles from my house, and I know friends who lost their home and everything they own. This is, of course, horrible for me and everyone who lives here. I want to help, but they're asking people to stay away and let emergency crews get through to search for bodies and hopefully survivors. I know in the days and months, even years, to come, they will need physical help, but for now the only thing I can do is send money and pray. #prayforoklahoma has been trending on Twitter for the past two days, and I've seen this tweeted by celebrities and people all over the world: "Pray for God to be with the people of Oklahoma." And this isn't just Oklahoma. This is where my rant comes in. We don't need to be praying for God to be with us. We never have to pray for God to be with us, in fact. Because here's the thing: God is always with us. We can thank him for being with us, but when it comes to prayer, what we need to be praying for is peace for those whose homes were destroyed and for those who lost loved ones. We need to pray for healing and understanding for those who are angry and confused. We need to pray for comfort for those who survived. What we don't need to pray for is that God will be with us. I find it comforting that God's presence is not something we need to question or pray for as if it's an unknown. Sometimes knowing he's there is the only thing that's comforting in times of heartbreak. I think the word prayer itself is misused quite a bit. We throw it around in place of "thinking of" because it sounds better or more official or something, but are we really praying? A prayer isn't a good thought and it's not a hug. A prayer is a cry to God, a conversation with the one who created us. I personally try not to use the word prayer if I'm not actually going to lift up a prayer. I'm not saying we shouldn't pray or we shouldn't tell people we're praying for them, and I'm not trying to say I'm judging people or that I'm better than anyone else. I'm saying we shouldn't take the concept of prayer so lightly. I also think that to pray for God to be with us is failing to understand the most basic concept of our faith, which is that God IS with us all the time. In fact, he's there when we DON'T want him to be there. Like when we're gossiping or lying or cheating or stealing. Whether or not you believe that he's there isn't for me to discuss or judge (although I would be happy to if you want to shoot me an email), but I do want to say that I believe it, and better yet: I've felt it. I know it's true. So the next time tragedy strikes and you go to tell someone you're going to pray for them, make sure you actually DO pray for them. If not, just be honest and say you're thinking about them. And don't pray for God to be with you. It might not feel like it all the time; I get that. But it doesn't change the fact that he already is. I completely agree with you. I think we use the word "prayer" way too much as a society, when prayer is something that is sacred and a personal conversation with God. And you are right, prayers of peace and understanding are what you need now. Prayers of peace for all of those affected by the storm. I love this post - I completely agree. It's easy to feel lost in a world that so often sees destruction and tragedy, but though it all, God is by our side. Thank you for sharing - it was a reminder that I needed today. I know a fellow Okie who would be in complete agreement with you, and would be so moved by hearing such thoughtful, clear, compassionate theology expressed by one of his grads. That would be Brian Hartley. Now, to figure out this technology business so I can send him this link. Totally agree that God is with us no matter what! Thanks for this post! Will be praying for peace. I'm really glad you talked about this. I think that a lot of people like to say (over and over) how much they are praying for people in a disaster simply so they can feel like they are doing something and showing that they care without having to actually make any effort or sacrifice. A lot of those social media updates that just say "I'm praying for everyone!" a lot of times make me think that those people don't really care, they just want to be in on the drama. I don't personally pray, but I am really glad to know that the people I am friends with genuinely believe in what they are saying, and follow through with their actions. I'm grateful for all the genuine people in my life. Yes, ma'am! God is the same yesterday and today. He never left us. I also can't stand when people say they found God. You can't find him becuse he was never lost. God is ALWAYS there. We are the ones who were lost. Well said and I am with you on the overuse of the word pray! I feel like it's just something people say to look good or feel better about themselves. If you said you were then get on those knees and PRAY! God is with us at all times!!! This may be the most beautiful "rant" I've ever read :) Thank you for writing so eloquently and thoughtfully about a delicate and timely issue. Amen to your post. Very well written! I agree with every word! I'm always hesitant to say "I'll pray for you" if I actually just will be thinking of them! Found your blog through the May Challenge. About to go poke around on here. Lol. So true. God is everywhere, all the time. I think it's more important to pray for people to recognise that he is there, through the good and the bad. So many people only 'see' God when there's a tragedy, but he is there all the time. I think praying for GOd to be with you is a lot like praying for your house not to be on fire when it is. You cant change what already is. If GOd is there, hes there, if your house is on fire, its on fire. INstead pray for the guidance to do the helpful thing and the strength to endure. Well put, Reese. It is such a comfort to know that even in the midst of the most raging, horrible storms, God is with us. I appreciate your thoughts, because they especially hit home with the way I've thought about a lot lately. However, I could be mistaken, but I don't believe you are correct in saying we don't need to pray for God to be with us. Yes, he will always be with us, and so logically it would make sense for us to not need to pray for him to be there. But the scriptures teach the idea that we should call out for him to be with us. Psalm 91:15 "He will call on me, and I will answer him;I will be with him in trouble, I will deliver him and honor him." When he calls, God will be with him. What is the call? "Be with me, LORD!" I loved this, especially the part with how people throw the term "prayer" around and rarely take it seriously. I have friends that I know aren't believers and use it frequently, but I do also agree with what the commenter above me said. I think most people mean well when they say that they are 'praying for you' even though I am sure that they really just mean that they are thinking of you! I think what we all need to be doing though is PRAY! And we need to start right now! I wholeheartedly agree with you--prayer is powerful, but some things you don't need to pray for. That God will never leave or forsake us has already been promised. Also, with the question of "I'll pray for you." The follow through is so important. I don't think I've always, throughout my life, paid so much attention to making sure I follow through on praying for people, but lately I have, because it is important. http://lookslikemaybe.blogspot.com/, and it's so cool that you share a birthday with my favorite-Jessica Simpson :) Thanks for the comment last night. i don't think i would have thought of it that way but you are right. god is always with us and we should be thanking him for that and praying for peace for those people. thank you for sharing this! Agreed!!! Just came across your blog today.....nice to into some other okie bloggers!